This text was first published in French. In the winter and fall sessions of 2017, I used Facebook to help students develop an awareness of the concrete applications of the subject that I was teaching them. The first time I used it was in an elective astronomy course. The second time was in the Electricity and Magnetism course in Natural Science (Health Science profile). At the beginning of the session I created a private Facebook group and gave the link to the students through LÉA. The students then sent a request to join the group from their personal Facebook page and I accepted them in the group. I did not have to become “friends” with my students. Naturally, I took special care to set up my Facebook account to ensure the total privacy of my information. At the beginning of the session, I distributed, on LÉA, a document that reminded them of the instructions for the assignment, the rules for displaying common courtesy as well as the compliance with copyright regulations. Students had to do some research to find content to share with their classmates. They saw their classmates’ posts in their news feed. Sometimes they only read the title of the news item or article, but this could still be instructive. At the end of the session it was easy for me to verify whether each student had the 4 required posts. I simply entered the student’s name in the search box on the group’s page and I could see all of the posts come up. In the astronomy course, some students posted more than 20 times! Managing the groups and making sure each student participated didn’t take up much time. I just had to “like” the posts that I thought were relevant. I found that this was time well spent, because the posts to the group allowed the students to understand how the course content could be useful in “real life”. Facebook is already part of the students’ lives. I could have done the same activity on a LÉA or Moodle forum, but I preferred to use Facebook so that the activity appeared less “academic”. The course’s scientific publications then become part of the student’s every day lives because they appear in their news feed among other posts from their friends. I really enjoyed reading the students’ posts. I even learned a few things myself on recent discoveries and the use of new technologies. But, especially, this has fuelled conversations in class. I often made reference to some of the group posts. While presenting examples in class, I sometimes could make connections with a post that was made to the group. For example, while talking about the magnetic levitation train (maglev), I spoke about a video on the subject that a student had shared. The students had to find their own reliable sources of information. I spoke to them about, for example, the IFL Science Facebook page and the Learn Engineering YouTube channel, but most found their information elsewhere. They had to make sure that their source was trustworthy. I obviously took the opportunity to talk about fake news in class. We discussed the impact of publishing or disseminating a fake news story. I believe several students became aware of the importance of not releasing fake news stories. Needless to say, that the students who were duped the first time made sure not to be deceived again! I liked to see that the students were creative in their search for information. Some tried to get the others to laugh. For example, on Valentine’s Day, a student of the astronomy course posted a picture of a flower-shaped nebula (NGC 7129). 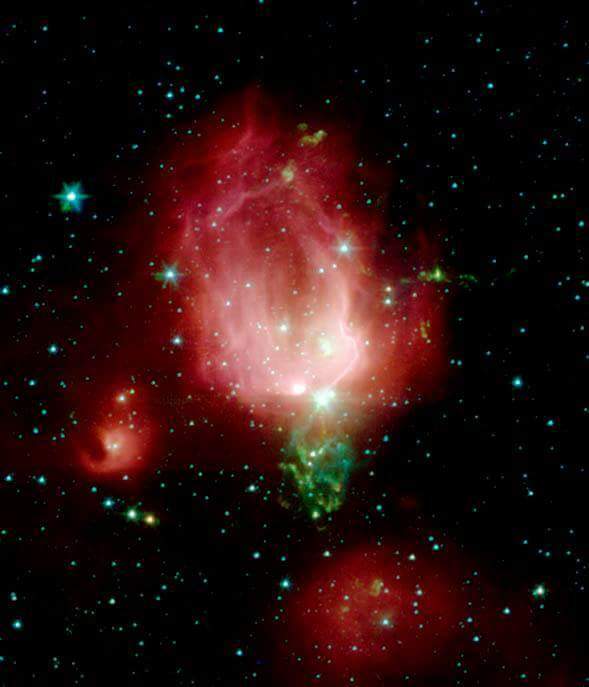 A rose-shaped nebula. The picture was published on Facebook by Mont-Mégantic national parc ASTROLab on Valentine’s Day and then shared on the astronomy course group page by a student. Here are 2 other interesting posts made by students in the astronomy class. Only one student told me that he didn’t have a Facebook account and didn’t want to create one. I suggested he send me his publications by MIO. Unfortunately, this student didn’t benefit from reading his colleagues’ posts. However, since it was only one student, it was not a major issue. The activity allowed them to learn something. The activity stimulated their interest in the content. The activity allowed them to understand the usefulness of the subject matter in their every day lives. The majority of the students often read the titles, but only occasionally clicked on the link to see the entire article. The students found it rather amusing to post to the group. 85% of the students said they would like to do the activity again in another class. I believe this type of activity could be integrated to a course in any discipline. Éric Laflamme has taught physics at the college level for 10 years. He is currently teaching at Cégep Edouard-Montpetit. He holds a master’s degree in biophysics from the University of Montreal, a DCS in electronic conception as well as a DCS in music, jazz guitar. Greatly interested by the connections between games and learning, he completed an AEC in video game design at Campus ADN. Éric Laflamme is the founder and designer of the educational platform modappi, winner of 3 prestigious awards in Quebec. He is the designer and programmer of self-corrected random exercises used in the online courses of modappi. He is a co-author of “Mesures et incertitudes en laboratoire” and “Maîtriser les vecteurs en explorant le sol de Mars”, awarded a prize in 2013 and 2016, its theoretical content is associated with online courses on modappi. Éric Laflamme Il est enseignant de physique au collégial depuis près de 10 ans.Il enseigne présentement au cégep Édouard-Montpetit. Il est titulaire d’une maîtrise en biophysique de l’Université de Montréal, d'un DEC en Technologie de conception électronique et un DEC en musique, en guitare jazz. Grandement intéressé par les liens entre l’apprentissage et le jeu, il a complété en 2017 une AEC en design de niveau de jeu vidéo au Campus ADN. Éric Laflamme est le fondateur et le concepteur de la plate-forme éducative modappi, gagnante de 3 prix prestigieux au Québec. Il est le concepteur et le programmeur des exercices aléatoires auto-corrigés utilisés dans les cours en ligne de modappi. Il est coauteur de Mesures et incertitudes en laboratoire et Maîtriser les vecteurs en explorant le sol de Mars, primés en 2013 et 2016, dont les contenus théoriques sont associés à des cours en ligne sur modappi.